Barcelona and Madrid, which once made common cause against Franco, have ceased to understand each other. Barcelona—A friend of mine, Núria, a Barcelona-born Catalan, has always believed in the unity of Spain; she has never wanted Catalonia or the Basque Country—Spain’s wealthiest regions, each with its own culture and language—to secede. However, not long ago Núria changed her mind. “How come?” I asked her. “I can’t go against my own people when they want Catalonia to be independent,” Núria answered. A columnist from Madrid, who was present that evening, didn’t take long to state in his newspaper that Núria had changed her opinion because opposing secession had become politically incorrect in Catalonia. “You didn’t understand me properly,” Núria tried to explain to him after reading the column. “What I meant was that Catalonia and Spain have entered a cold war, and I am on the side of my people.” But the columnist still didn’t get it. Barcelona and Madrid, which once made common cause in the struggle against the Franco regime, have ceased to understand each another. I told this story to Aleksandar Hemon, a writer of Bosnian extraction who now lives in Chicago but who recently taught a course on creative writing in Barcelona. We were sitting on a cafe terrace in the Gothic Quarter, the borders of which are marked by two medieval cathedrals. While Aleksandar selected a few tapas for lunch, I distractedly watched people crossing the square: students, women in multi-colored saris, Africans in hats that looked out of place on such a warm day. I told Aleksandar that Barcelona had a long tradition of welcoming foreigners, be they political exiles or economic migrants. In past decades, many Latin Americans found refuge here, including Mario Vargas Llosa, Gabriel García Márquez and thousands of Cubans. What’s more, during the Franco dictatorship, over a million migrants from the then-forsaken Spanish south migrated to prosperous Barcelona. Back then, Franco tried to kill two birds with one stone by offering work to unemployed southerners while Castilianizing rebellious Barcelona. In reality, what he did was turn the Catalan capital into a bilingual city—one that was more open and cosmopolitan—never suspecting that he would convert many Andalusian migrants into Catalans who were proud to have prospered in their new home. Franco banned the Catalans, Basques and Galicians from using their languages in public, but forbidden fruit tends to be the sweetest. After the death of the dictator in 1975, Spain’s minority languages and cultures flourished like spring buds after a long winter. I told Aleksandar that, after twenty years of living in Barcelona, I have noted that although judicially speaking Catalonia is one of Spain’s seventeen autonomous regions, in practice it works as a kind of enclave. It has always earned admiration from other Spaniards for being hard-working, modern and open to the rest of the world. It is Spain’s window to the rest of Europe, and it’s an important international port. At the same time, it irks some Spaniards that Catalonia is different. Those Spanish politicians who have ruled with an iron fist have always tried to suppress this region—in vain. In Madrid, there are people who tell me that Spain and Catalonia form part of an inseparable family, but there are also many Spaniards who understand the Catalans’ dissatisfaction. “The nation’s government cannot limit itself to using the Constitution as a trench in which to hide from the demand for a consultation,” wrote Javier Pérez Royo in Spain’s main newspaper, El País. “An exclusively judicial option can only lead to defeat. The Constitution is a judicial touchstone, but it is also a political pact.” The PP, which currently governs with an absolute majority, has dropped to fourth place in the latest opinion polls. It is this same party that, over the past two decades, has governed over half of that time and that in the 1980s had ministers from Franco’s fascist government in its ranks. This year the PP introduced a gag law that allows the government to fine or otherwise punish the organizers of large-scale anti-government protests. 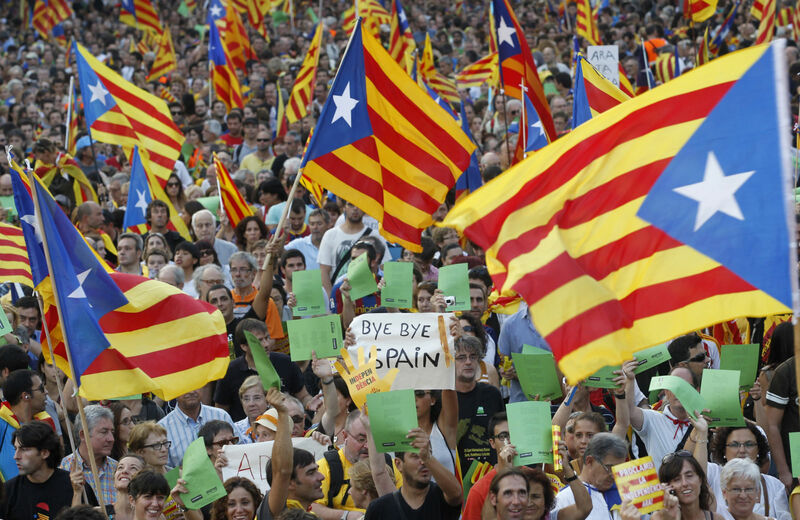 The international outcry over the law has found great support in Catalonia and feeds into the region’s resentment of central government policy regarding independence. According to the pro-unionist El País, of those who wish to vote in this Sunday’s consultation, 48 percent would support independence and 48 percent would not. According to the paper’s most recent poll, taken at the beginning of November, most Catalans favor a major change of status for Catalonia within Spain, rather than political independence; this is also what most international observers have been advising. However, the percentage of people supporting secession is slowly growing. Why? As a Madrid historian put it, the central government, with its aversion to dialogue, is simply manufacturing more independentists. When we were saying goodbye, with the sound of the harp audible between words, Aleksandar asked me if the European Union would smooth things over. I told him that the EU has no wish to see Catalonia separate from Spain. If it did so, it could establish a precedent for other secessionist regions (Scotland, Friuli, Bavaria, etc. ); moreover, fragmentation of Spain would destabilize the euro. I crossed the Rambla, whose sidewalk, with its Miró mosaic, was peppered with yellow leaves that had fallen from the plane trees. I had a meeting at Barcelona’s Center for Contemporary Culture with the Irish writer Colm Tóibín, who spends his time between Dublin, New York and Catalonia, where he used to live and where he still has a house. The sun was setting over the sea when I got off the Montjuïc funicular and headed for the Miró Foundation, a white modern building that overlooks the city. Two of its employees, Dolors and Oriol, were waiting for me in the restaurant. Over a copious and imaginative meal, we planned out a season of public lectures. Dolors commented on the recent manifestos released in Madrid about the Catalan consultation; one was published in the right-wing El Mundo paper, the other in El País. One of them, which was signed, among others, by the writer Mario Vargas Llosa together with several far-right journalists, demanded that the Spanish president ignore the Catalans’ request for a consultation. The other manifesto, signed by various social-democratic intellectuals, asked the president to take note of the Catalans’ representatives and their requests, and proposed a reorganization of Spain into a federal state in which all federated entities would have the same rights. After dinner, before going into Montjuïc Park and then the streets, I gazed at the illuminated city, a display of glittering jewels. I could see Jean Nouvel’s Agbar Tower, which was inspired by the towers of Modernist architect Antoni Gaudí, which, in their turn, were modeled on the rocks of the nearby mountain of Montserrat. I thought about the future of the Catalan capital that lay at my feet. The city will survive, just as it survived bombing from the planes sent by Fascist Italy to support Franco’s rebellion in the Civil War. Perhaps with time, its inhabitants will want to make peace with Spain, and Spain will make peace with this proud but now angry people. The Madrid columnist will understand the choice of my Barcelonan friend Núria. As I went down into the park, the city shone through the branches, as if it wished to tell me that even now, as a fierce struggle rages over Catalonia’s identity, this open, cosmopolitan city will continue to live its own life. Monika ZgustovaMonika Zgustova is a novelist, short-story writer, and playwright who was born in Prague and now lives in Barcelona, where she writes for El País and translates Czech and Russian literature into Spanish and Catalan.